Perfect for True Nature Lovers & Avid Birdwatchers. The Monteverde Cloud Forest Reserve is located along the Cordillera de Tilaran mountain range. The Reserve spans over 10,500 hectares of tropical forest with 90% being virgin forest. There is so much biodiversity to be found in the area with over 2,500 plant species (one of the most orchid-populated places in the world), over 400 different bird species, hundreds of animals, and literally thousands of insects. 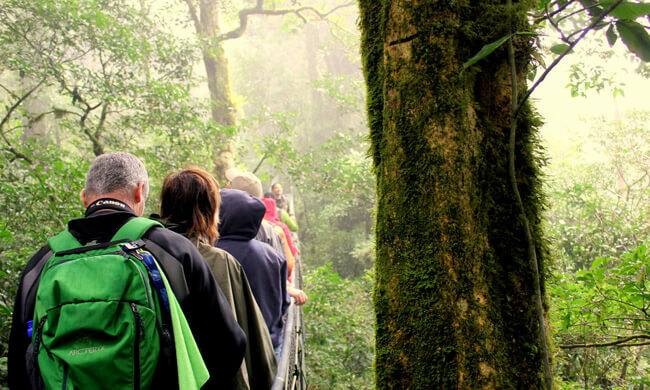 The Monteverde Cloud Forest tour is a great tour for anyone who has a true love for nature and is looking for an active half-day walk in the cloud forest. You will be picked up from your hotel and driven a few minutes to the Monteverde Cloud Forest Reserve. Your local naturalist guide will take you on a 4.5-hour nature tour through the mountainous forest, helping you spot everything from tiny orchids on a fallen branch to camouflaged hummingbirds, bringing home the complexity of the cloud forest. Your guide will be a wealth of information, pointing out the golden toad’s unique habitat and helping you see birds like the resplendent quetzal (the most beautiful bird in the Americas), the three-wattled bellbird, and the black faced solitaire. Trees like strangler figs, avocados, and cecropias (guarumos) are in abundance, as are epiphytes like bromeliads, orchids, and mosses. The main purpose of this tour is to experience the incredible interconnectivity of the rich biodiversity found in the cloud forest. At the end of your hike, you visit the local women’s handicraft cooperative where you can view and purchase locally made crafts. Another option for anyone who has a true love of nature and is looking to experience the forest at night is to go on a Monteverde Cloud Forest Night Tour. The purpose of this two-hour night hike is not necessarily to find nocturnal wildlife, but to have a different perspective on the cloud forest in which you are using your ears more than your eyes. Turn of your flashlight for a few minutes to see the fireflies light around you or a phosphorescent mushroom on the ground! Day tour includes: Entrance fee, tour with a bilingual naturalist guide, transportation,15-minute stop at CASEM (local women’s handicraft cooperative). Night tour includes: Transportation, entrance fee, guide, and snacks. What to bring: Comfortable clothes, hiking boots or sturdy shoes, binoculars, hat, rain jacket, camera, extra cash.